theeSatisfaction. Photo: Screen grab from You Tube video posted by imstd from the show. This has to be probably one of the most anticipated shows of the year so far. 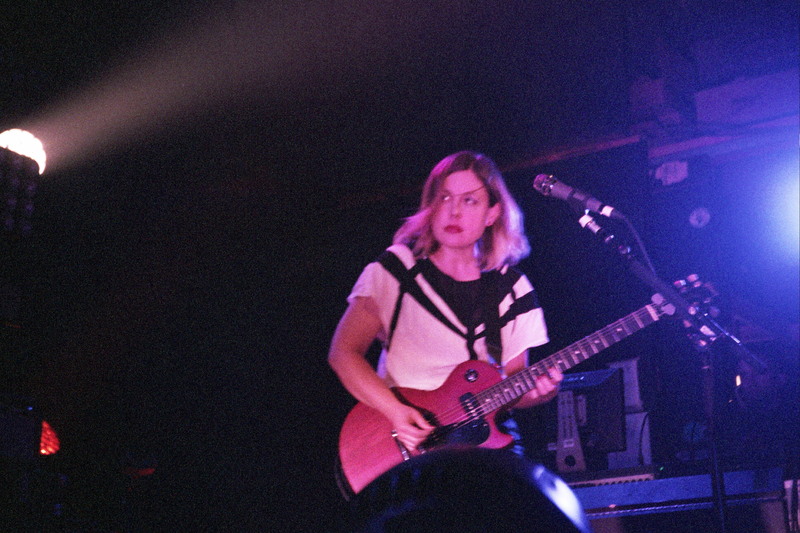 When news of Sleater-Kinney making a new album emerged late last year it basically surprised everyone. As the day approached I was visiting my friend David in Kansas City and was headed to Columbia that morning. So, with dark clouds in the air I headed through a mix of ominous clouds and stormy weather to Como where I ate, hung out for a bit, and came across what I'd later discover is the start of another car problem along the way before getting in line for this long awaited show at the Blue Note. raps work well within the no frills sonic production they've created and emerges as something that's in the rap world but not necessarily of that world. Regardless of genre you have to respect an act that has a song called "Seattle's Restraining Order Against The Sun." 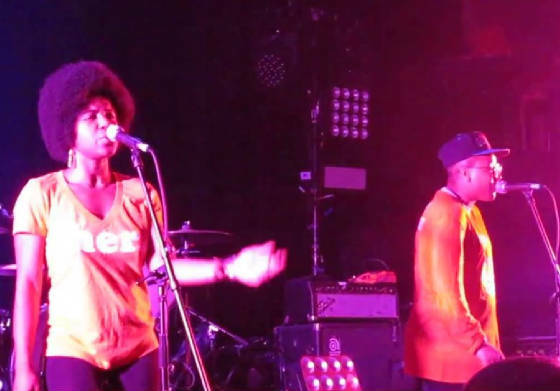 theeSatisfaction may be slightly unexpected as an opening act to some of this crowd but they did take things in an interesting direction and got people pumped for what was ahead. The tension was building in the crowd as they waited for Sleater-Kinney to return to the Blue Note after almost 15 years. Kicking things off with "Price Tag" Corin, Carrie, and Janet unleashed a torrent of underground rock that draws from punk, blues, pop, and experimental tones to create their sonic brew. Walking a line between tracks from the new album and their classic work their songs were raw yet simmered until exploding with a midtempo swagger that was aggressive, sultry, and comes off like no other band. By the time the set climaxed the sold out crowd was entranced and in the palm of the trio's hands. Then they kicked off an encore with "I Wanna Be Your Joey Ramone" and the intensity went up a level for four songs that fed off the crowd's anticipation and delivered it back to them until "Dig Me Out" brought the night here to an end. Yeah, there were some songs that it would've been cool to see them play but a band with this repertoire may leave out some fan faves while not disappointing the fans overall. 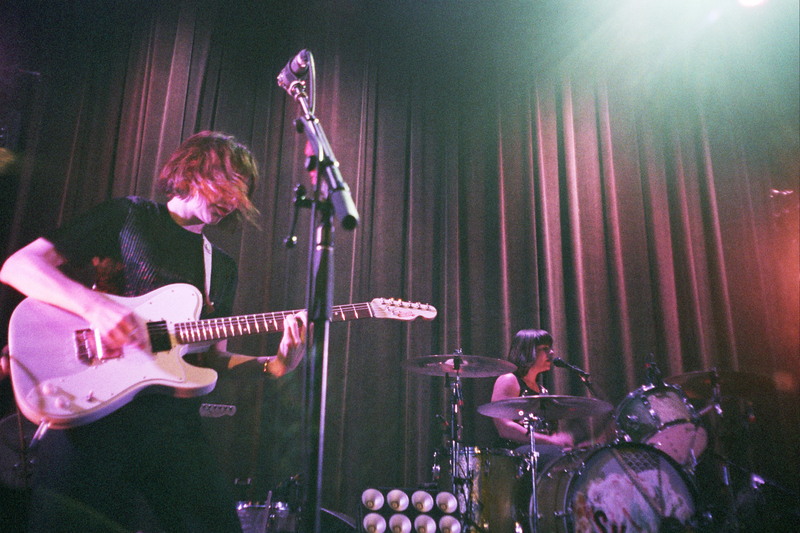 Late last year Sleater-Kinney took everyone by surprise with new music. Their tour lives up to the expectations and adds fuel to the fire. Then the show was over and the crowd began to venture out into the slightly chilly and wet late April evening. A bunch of people waited by the stage door for the band to come out. As I picked up an album I walked by for a second and wondered if I should wait. However, I also had another show to make and I think the band would've been cool with the circumstances. I would walk by between acts but I decided to head over to my next plans for the night. All contents this page ©2015 Boone Stigall/The Trouble With Normal unless otherwise noted.